This is a classic Hollywood musical, and the film that introduced the world to Debbie Reynolds. Yet it has a fascinating plot and some wonderful set pieces which seem to get pushed aside in favour of it’s better known numbers – “Broadway Melody” and “Good Morning” being just two of my favourites. Gene Kelly plays Don Lockwood, a silent movie star alongside Lena Lamont (played wonderfully by Jean Hagan), and whom the studio’s publicity department are desperately trying to link romantically. Lamont believes the hype, Lockwood doesn’t. But things change drastically for the stars and the studio with the advent of talking pictures and the realisation that “The Jazz Singer” is a real hit, rather than a novelty. Technology – and the movies themselves – must change if they are to keep up. Don and Lena find themselves facing their first flop. And this is the central story of the entire film. The development of the talkie is possibly the most fundamental change in the history of cinema (apart from possibly the development of colour film). Many silent film stars found that they simply couldn’t make the transition into the new medium and their careers ended very suddenly. I admit I wonder how many of them had voices to rival Lena Lamont’s, but if truth be told, a strong Brooklyn accent didn’t seem to do Al Jolson any harm. About a quarter of the way into the film, there is a wonderful montage where the viewer is given a look at what would have then been the very height of fashion in the mid-1920s; it is a sequence where the studio is experimenting with different types of talking picture to see what they can get to work. This sequence is where we are reintroduced to Debbie Reynolds’ character, Cathy Seldon, as she forms part of the chorus for the number. As a whistle-stop tour through contemporary fashion, one could do a lot worse – the outfits are stunning, even though nobody wears furs any more. In comparison, Cathy’s more everyday dresses featuring dropped waists and pleated skirts seem dull, but they were essential for many young women of the era. It is exactly the kind of thing they would have worn, right down to the low heeled shoes with cross straps (to stop them falling off while dancing), plain raincoats and cloche hats. If I’m honest, I will admit to spending as much time dreaming about the clothes as I do singing along to the soundtrack. Doesn’t everyone? The latest volume to be liberated from my “To Read” pile is Judith Mackrell’s “Flappers”, essentially biographing a decade in the lives of six culturally important women who each influenced the popular image of the flapper. It’s quite interesting; although the names are familiar, I knew very little about the lives of Diana Cooper, Nancy Cunard, Zelda Fitzgerald, Tamara de Lempicka, Tallulah Bankhead and Josephine Baker. It’s hard to say that they are representative of the 1920s woman, but they were certainly interesting to read about. As a product of her time, the flapper played a crucial role in the development of feminism, even if she wouldn’t have either recognised or understood the term, coming as she did fresh from the devastation of the First World War. The war itself was probably the biggest trigger for granting women’s suffrage, but it gave women a taste of independence, of being able to survive and make her own choices without having the rely on the input of a husband or father. 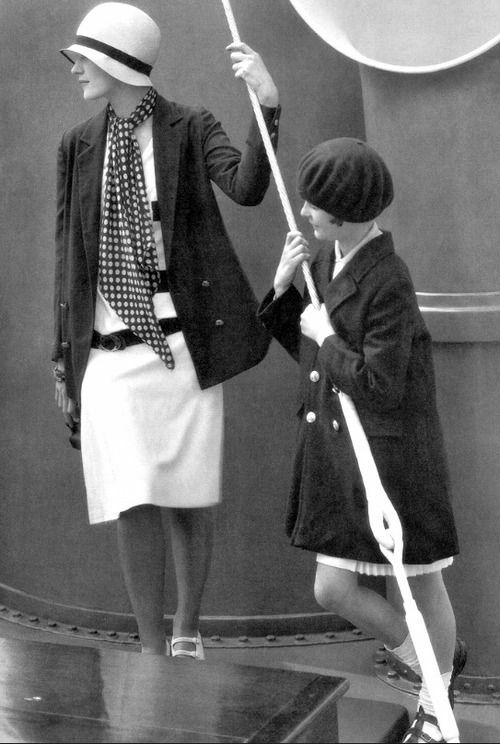 Unlike her foremothers, however, the archetypal flapper claimed this independence as a right rather than a privilege. The conventional image of the flapper that was promoted by the (white, male, conservative) press was of a woman who cut her hair, raised her hemlines, smoked and drank in public and had questionable morals. While there was a grain of truth in this, it was unquestionably influenced by the attack on the status quo of huge numbers of young women simply refusing to submit to rules which they now considered archaic and irrelevant. For the first time, women made up the majority of the population. They would need to live independently if they were to survive, and frankly, being treated as a second class citizen simply wasn’t going to be acceptable any longer. One of the key characteristics of the flapper which seems to have been left behind over the years is that this was very much an expression of a woman’s right to choose. She wished to choose her career, her sexual partners, her mode of dress, her politics and beliefs, rather than having them imposed on her by an authority figure who not only didn’t understand the most basic aspects of being female but whose attitudes were dated and – it could be argued – were responsible for the carnage of the War, which seemed increasingly senseless as time went on. It is this demand to be able to choose which I think needs to be recalled. Young women today have a lifestyle that the flappers of the 1920s dreamed of, but there is still room for improvement and still cause for revolution. While that is the case, there remains a need for the attitudes of the flapper, that two fingers to the status quo that raises questions and considers alternatives. In the Twenties, corsets were shunned; in the Sixties, bras were burned. In the 21st century, we may have run out of underwear but we still need those strong women prepared to kick the status quo into touch while looking utterly glamorous. Our grandmothers fought for us to have the lifestyle we have now. What are we, as women, prepared to risk to keep it? My gran had a fuchsia plant when I was growing up. I remember it had dark pink outer petals (a colour that I’d now call fuchsia) and mauve inner petals, and I used to spend ages trying to pop the little buds open to see the flowers. How I didn’t kill the plant completely is beyond me; it wasn’t intentional. I just liked the little bell shaped flowers. 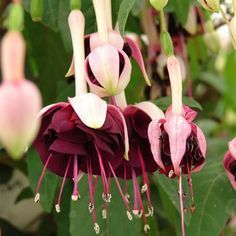 Unlike with the iris (see my earlier blog post), I was aware that fuchsias came in a variety of colours and even different shapes – the double fuchsias are like little ballerinas in great big flouncy tutus – and not just in fuchsia pink, either. In fact, I’m starting to wonder if fuchsia pink is actually one of the rarer colours for this flower! This one, for example, is known as “Ballerina” – which simply reinforces the idea of the petals being tutus – and is a gorgeous deep mauve with white inner petals, streaked with mauve. I think it’s the contrast between the two which really catches the eye. There’s something strangely exotic about it; I can almost imagine it on a tropical island. 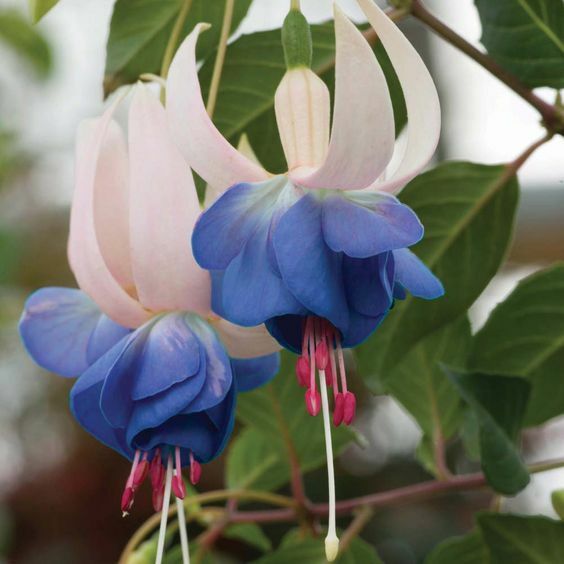 This flouncy beauty is a double fuchsia, known as “Blue Eyes”. I particularly like the combination of pale pink outer petals and beautiful lilac inner petals. There’s something slightly 1950s about it as well which I find especially appealing. It’s always unusual to find a true blue flower, but this is “Delta Sarah” and is especially vibrant against the pure white outer petals. 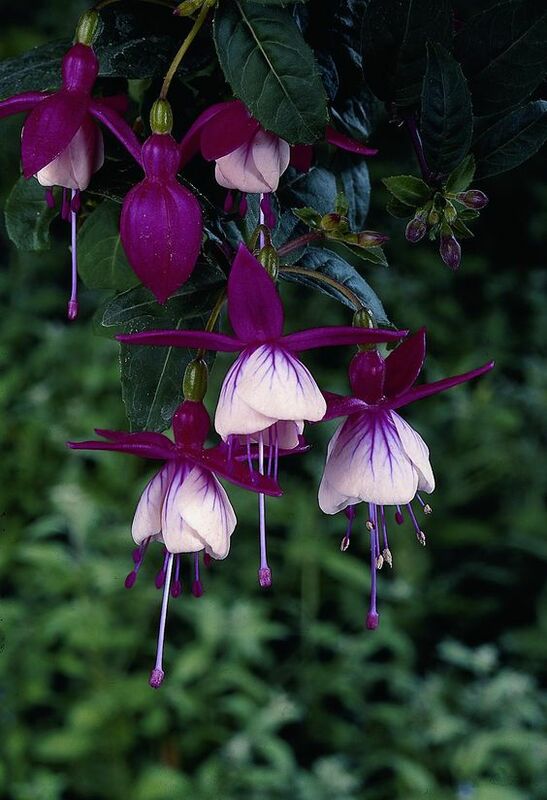 Unusually for fuchsias, these outer petals bend right back, allowing the inner ones for form a trumpet. It’s a lovely pretty flower, and I want one. But not as much as I want one of these. Another double fuchsia, this is “Velvet Crush” and I think it is simply wonderful. I especially love the maroon inner petals, so voluptuous. It’s very aptly named; the colour is of a rich velvet and there’s something of the berry about it. I almost want to eat them. 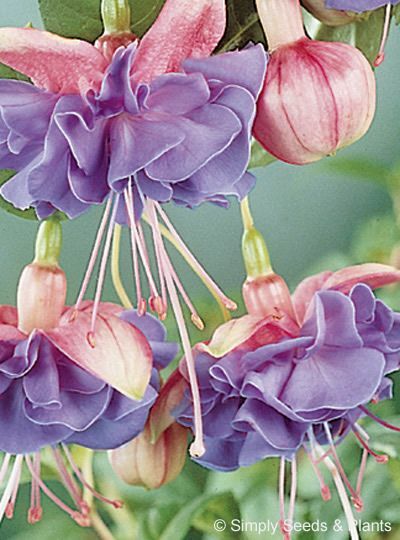 So, from my Pinterest boards, four randomly picked fuchsias and not a fuchsia colour among them. Perhaps someone ought to have a word with whoever it is that gives colours names; there’s more to fuchsia than pink, it seems to me. Alexander McQueen had a fantastically inventive mind. The recent exhibition of his designs at the V&A, entitled Savage Beauty, could only give some idea of this. My Pinterest boards are chock-full of his couture catwalk designs, even though I’ll never be able to own one, let alone wear one. He was never a believer in a woman being larger than a size zero. This is a dress that McQueen designed while he was working at Givenchy, the French couture house whose muse was, for many years, Audrey Hepburn. 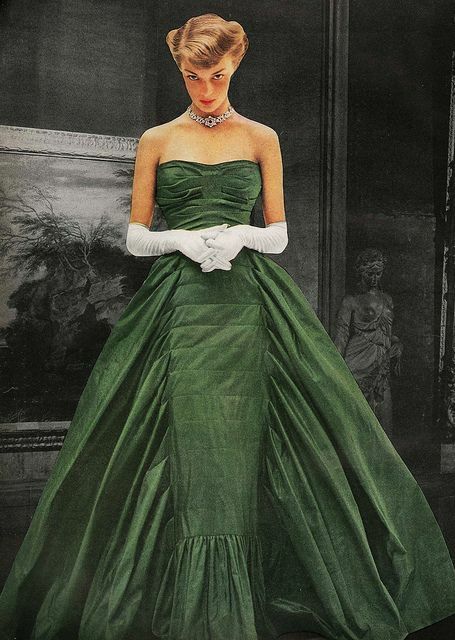 I simply couldn’t imagine Hepburn in a dress like this; she was too wide eyed and innocently beautiful. This is much more a Jane Russell kind of dress (although I expect even she was too voluptuous for McQueen’s clothes). It oozes dangerous glamour. Rather than being genuinely scaled, something I wouldn’t have put past McQueen at all in those days, it is the arrangement of sequins into a soft scalloped pattern that emphasises the distinctive drape you get from a bias cut dress. Strangely, I think you’d need a real figure to carry this dress off; like all of McQueen’s clothes, they’re not for everyone. Sponge The base of the trifle is always sponge cake, usually in fingers but you may find it easier to shape your sponge to your bowl. Some people soak the sponge in sherry for the classic sherry trifle; some don’t. The sponge is, however, essential to the structure of the trifle, so you can’t forget it. Jelly This can be any flavour, and as alcoholic as you want. I grew up with brightly coloured trifles, so bright red strawberry or raspberry jelly would be my choice, or lime green for Halloween. I’m giving myself ideas now. Leave this to set before you put the next layer on. Custard Once the jelly has set, you can add the custard, which should be cooked through but added warm to the trifle. Custard is usually yellow, but I’ve seen trifles with pink custard, chocolate custard – I’m sure my Halloween trifle will end up with black custard. Cream This ought to be whipped to soft peaks and spread over the top of the custard to cover the trifle. I don’t believe in leaving the custard exposed, that’s how it gets a skin and nobody likes that. Besides, if you don’t cover the top of the trifle, how are you going to decorate it? Decoration Now here’s where your imagination can run riot. 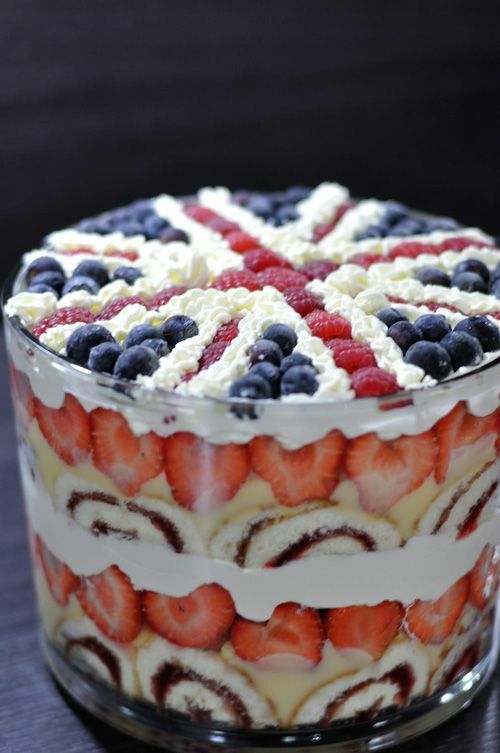 You can decorate the trifle with pretty much anything; fruit, hundreds and thousands, edible flowers, whatever you like. And then the best part – eating it! Writing all of this has made me hungry now. What better excuse do I need to practice dying my custard for a Halloween trifle? Quilting. It’s not something you see very often in an evening gown; I suppose it takes a certain amount of panache to pull off. Especially if the gown is made of silk taffeta, as this one is. Can you imagine what that must have been like to sew? I expect it would make the dramas on Great British Sewing Bee seem like a broken biscuit at a church tea party. I don’t even want to think about it. Regardless, I shall sit and gaze in awe at this beautiful gown, designed by Adrian of Hollywood and modelled here by Jean Patchett in the November 1948 issue of Vogue. It is difficult to see the true shape of the skirt, but from a close look at some of the quilting, it appears to be a sheath style dress with an overskirt designed to resemble side wings. The central (sheath) panel is quilted, as is the bodice, whereas the side panels are not and allowed to drape. Patchett teams the dress with an elegant diamond choker and white opera gloves. Now I know this isn’t something that you’d wear to the supermarket on a Saturday morning, but wouldn’t you just love to wear a dress like this – just once? It would be impossible not to upstage the bride/film star/lady mayoress if you turned up wearing it… it’s almost worth doing! This may be because I love Turkish Delight anyway, although I’m a notorious fusspot when it comes down to it. I grew up with Fry’s Turkish Delight, so covering it in chocolate is absolutely fine by me. I like the original rosewater and the pistachio – if it has pieces of pistachio in it – but not the lemon, the cinnamon or the orange flavours. I’m told there’s a pomegranate one, and I love pomegranates so I’m keen to try it. Anyone know where I can get my hands on it? 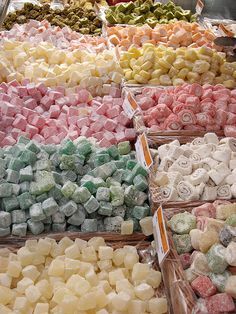 Turkish Delight isn’t exclusively Turkish; it’s a popular sweet throughout the Mediterranean and can be found in North Africa, Greece, Cyprus and even Bulgaria. At its most basic, it is a very sweet rosewater jelly covered in icing sugar and served in lumps. The addition of chocolate appears to be a marketing tool in the US and UK, but I confess it is one with which I heartily approve! It’s known as rahat or lokum in most places (or even rahat lokum) but if you’re on the tourist trail, it’s very easy to find and is almost always in the Duty Free. The hardest thing is trying to work out which flavour you want! In the meantime, I shall happily smother myself in a certain body lotion and try not to eat myself. ** Their Vanilla Custard one is lovely as well, but I’m not sure they’re still making that. If you can find it, swipe it! 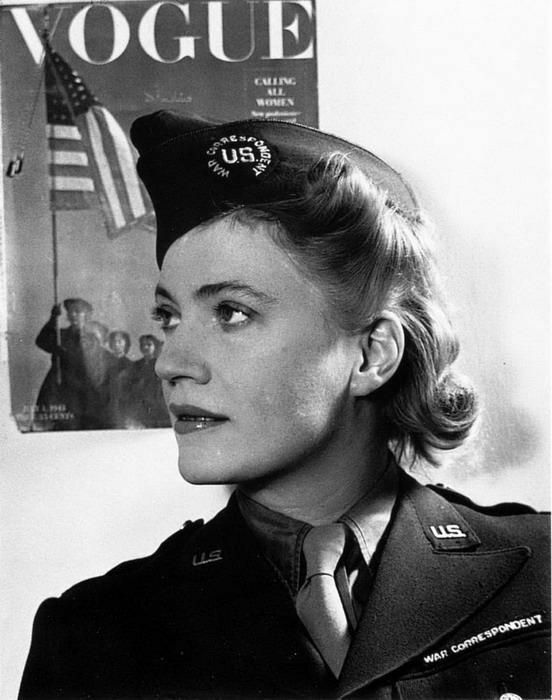 Lee Miller was an American photographer, model and Surrealist muse who became Vogue’s war correspondent during the Second World War and was responsible for some iconic images of the Blitz, Paris after liberation and the horrors of Buchenwald and Dachau. She worked with famous artists such as Man Ray and Jean Cocteau and was close friends with Picasso and Gertrude Stein. In later years, she married the British painter Roland Penrose. Miller is best known for her photojournalism during the war (although some of her pre-war Surrealist photography is among the best in the world, and was initially credited to Man Ray, with whom she was working at the time), and having initially documented the effect of the Blitz on London, she followed the US Army into France just after D-Day, documenting the progress of the Allies as they liberated the country. From there, she photographed the liberation of concentration camps, children in a Vienna Hospital and Hitler’s abandoned apartment. After the war, she continued in photojournalism but moved to Central Europe, in particular Hungary. As the Cold War was only in its very early stages, she retained considerable freedom of movement and photographed some startling images for Condé Nast publications. In later years, after her marriage, she became a successful gourmet cook and the home she shared with her husband soon became a place of pilgrimage for such artists as Henry Moore and Max Ernst. Unfortunately, the effects of her war journalism took their toll and she suffered severe bouts of depression and drank heavily. She sadly died of cancer in 1977. Miller was by no means the first woman to make her living as a photographer or war correspondent; I believe that may have been Martha Gellhorn, but I would have to check. Her close links with the Surrealists, however, make her photography all the more interesting and I think it’s a shame she’s little known. Imagine for a moment, if you will, that you are on the red carpet; you’ve been nominated for a BAFTA or some such award for your performance in “Glamourpusses R Us”. You’ve spent ages looking for the right dress before deciding on this particular gown by Valentino. The gown sparkles in the spotlights and glints with every movement you make. Wouldn’t you feel simply GORGEOUS if you wore this? Admittedly, this picture was taken at a recent exhibition of Ralph Lauren gowns, and the dramatic lighting and backdrop really set it off. It’s a sleeveless, slightly shaped shift style, covered from top to bottom in Swarovski crystals, painstakingly set in vertical lines to elongate the shape – and, of course, to sparkle in the light. I am not sure if this gown was designed for a particular person or occasion, but it simply screams red carpet and I’m surprised I’ve not seen it worn at a film premiere or awards ceremony yet. But that may be because I haven’t been nominated for anything…. 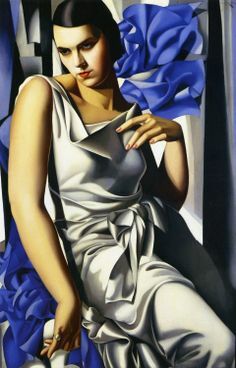 Tamara de Lempicka was a flamboyant, glamorous Polish artist who fled the Bolsheviks in 1917 after her husband was arrested and made her home in Paris, where she developed her distinctive Art Deco style. The majority of her major works were portraits and she was the most fashionable portrait painter of her generation. Indeed, her style remains popular with many contemporary Hollywood stars and A list celebrities owning some of her works. This painting is one of her last big portraits; the after effects of the Wall Street Crash and the Great Depression meant that such commissions were becoming increasingly scarce. She would charge somewhere in the region of 50,000 francs for a portrait, which could take up to three weeks to complete. Most of her sitters, like Mrs M, were society people and consequently could afford such a luxury as having their portrait painted. This is now in a private collection in France. Unfortunately, I’ve not been able to find out very much about the sitter. The style of the portrait is typically Lempicka – very geometric, clean lines, sharp colours. It is impossible to sense the growing darkness that pervades the early Thirties in Europe, and this feels very glamorous and I sense the influence of the early Hollywood movies. I have to admit that I do like Lempicka’s paintings (although her later works are less stylistic) and this is one of my favourites.